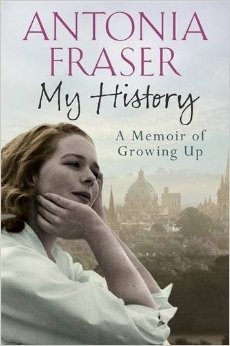 My father loves Antonia Fraser’s books – I think he’s read all her histories and some of her detective fiction too. I’ve only read Mary, Queen of Scots (1969) and that was so long ago it predates keeping a reading journal and I can’t remember what I thought of it. Presumably not enough to have wanted to read the rest of my father’s collection. As a devout Christian determined to translate faith into action, he was known for his bombastic style and his eccentricity. Although a shrewd and influential politician, he was also widely unpopular among Labour leaders, particularly for his lack of ministerial ability, and jumped from cabinet post to cabinet post, never serving more than two years at any one ministry. (See Wikipedia). Well, you wouldn’t expect a loyal daughter to write that, would you? It was Frank’s role as an Oxford don, however, that enabled the young Antonia to attend the remarkable Dragon School, founded in the 19th century to provide a high quality education for the children of Oxford academics. With a curriculum that focussed on Latin and the classics, the school was academically rigorous and fiercely competitive, which suited Antonia’s temperament. Although girls were vastly outnumbered by boys at the school, they were apparently treated exactly the same, (including playing rugby). At home, her parents were kind, but busy with politics. Like many of their class they abandoned their children to whatever staff they had at the time and were neglectful of their children to some extent. The children were expected to just get on with things, and during the war, to accept rationing and other deprivations without complaint. (Later, Antonia had to arrange her own debut, but it is difficult to feel any great pity about a socialist mother’s lack of support for this anachronistic ritual and it was Elizabeth, after all, who (in another example of fortuitous networking) found Antonia her life-changing job at the publishers Weidenfeld and Nicolson). Antonia read voraciously and met interesting people whose names are part of British cultural history, such as the Poet Laureate John Betjeman. In describing a way of life long gone, Antonia Fraser assumes a familiarity with the people she writes about, sometimes offering a brief explanation but sometimes not. Surprisingly, there’s no index so it’s not easy to provide specific examples, but one that I noted was an allusion to the Renaissance art specialist Bernard Berenson’s more controversial history with the art dealer Joseph Deveen on p.236. Never having heard of either of them, I was mystified until later discovering at Wikipedia that their professional relationship involved possibly dubious attributions which increased a painting’s value. My guess is that younger readers, or readers with less experience of British culture and history, would find this aspect of the memoir somewhat frustrating. The style is chatty and light-hearted, more interesting about the early years than her late adolescence when partying and finding her feet in the world of work. This is because the author traces the influence of the books she read, and has a droll self-deprecating analysis of her own childhood fantasies about becoming various historical figures. There are charming photos of her in costume as Lady Macbeth, and of her eventual wedding headdress which was based on an illustration of Mary, Queen of Scots in a book that influenced her passion for history. I was interested to see this book, H.V. Marshall’s Our Island Story: A History of England for Boys and Girls (1905) because one of my favourite books as a child was Kings and Things by the same author. I hadn’t realised how old Kings and Things was (1937), nor that H.V. (Henrietta Elizabeth) Marshall was a woman. (If curious, you can read Our Island Story online here). See also a review by Hilary Spurling at The Guardian. and a more waspish one by Rachel Cooke which shows only too plainly that if you had been persuaded otherwise, class still matters in the UK. Source: loan from a friend, thanks Lurline! I read several of her crime thrillers back in the day but ended up getting very annoyed as the heroine was totally sappy and easily manipulated into bed by any passing man. I think they’ve probably put me off wanting to read anything more by her, though her life does sound very interesting! *chuckle* By ‘heroine’ do you mean the female detective? Not like our Miss Fisher who (from what I’ve seen of the TV series) declines to have it away with her clearly interested male colleague! When are you going to review Louis de Bernieres book, The Dust that Falls from Dreams?